"HIGHEST RETURNS TO SHAREHOLDERS OVER THREE YEARS: CONSTRUCTION: Kerjaya Prospek Group Bhd - A Good Start To A Billion Ringgit Top Line | The Edge Billion Ringgit Club 2018"
In early 2016, when Kerjaya Prospek Sdn Bhd did a reverse takeover of Fututec Bhd for RM458 million, few would have guessed how well the company would do. A couple of months before the reverse takeover (RTO) was concluded, Kerjaya Prospek’s 70% unit, Future Rocks Sdn Bhd, secured a RM181.31 million contract from China Communications Construction Company (M) Sdn Bhd and a RM102.45 million contract from the Genting Group for building works at Genting Highlands. This nudged the company’s order book to above RM2 billion and the two jobs were indeed a precursor of what to expect. Kerjaya Prospek went on to secure more contracts and, as at Sept 30 this year, its order book stood at an impressive RM2.67 billion. Considering the company’s revenue is about RM1 billion a year, the order book should keep it busy for at least three years. In tandem with the number of jobs secured, the company’s share price has received a shot in the arm as well. The share price of 69 sen as at June 30, 2015, has more than doubled to RM1.50 as at end-June this year, translating into a three-year compound annual growth rate of 29.54% over the awards evaluation period. The counter has moved downwards from RM1.86 in early January this year. It has been the same earnings-wise. Just prior to Kerjaya Prospek’s RTO, the company shifted its focus from the design, manufacturing and marketing of lighting and premium kitchen cabinets into building construction, project management, interior fit-out and miscellaneous construction-related services for the premium residential property segment. Today, Kerjaya is a premium construction contractor with a high-end client portfolio that includes S P Setia Bhd, Eastern & Oriental Bhd and EcoWorld Development Bhd. More recently, the company has expanded into property development with two projects in the pipeline, in Genting Permai and Monterez, Shah Alam, with a total gross development value of RM500 million. 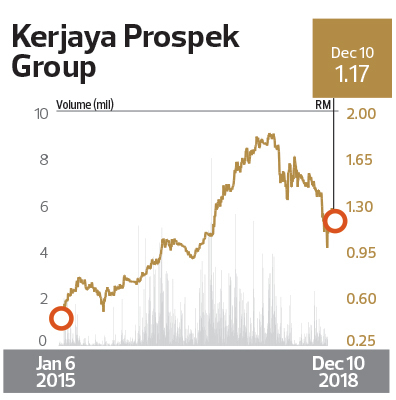 With the better outlook came better financials, Kerjaya Prospek’s net profit in FY2015 was RM16.14 million on revenue of a mere RM78.97 million. In FY2016, with the RTO concluded, net profit soared to RM99.62 million on the back of RM798.69 million in revenue. For FY2017, Kerjaya registered a net profit of RM124.5 million from RM955.67 million in turnover. For the nine months ended September this year, Kerjaya Prospek chalked up a net profit of RM104.39 million from RM803.43 million in sales, which, if annualised, would indicate that Kerjaya Prospek’s revenue could surpass the RM1 billion mark this financial year. Shareholders have also benefited from dividend payments. For FY2017, Kerjaya paid out six sen in dividends, 5.5 sen as an interim dividend, which was paid on Aug 15, 2017, and a half sen final dividend payout on June 12, 2018. It is worth noting that Kerjaya Prospek has a strong balance sheet. As at end-September, the company had fixed deposits and quoted unit trusts amounting to RM110.52 million while its cash and bank balances were RM154.22 million. On the other side of the balance sheet, it had short-term debt obligations of RM84.4 million and no long-term borrowings. For 9MFY2018, Kerjaya Prospek’s finance cost was a mere RM760,000. “Going forward, the group aims to focus on the construction segment as the main revenue driver. The group will continue to exercise vigilance and prudence in achieving its expansion objectives. Notwithstanding [this], the manufacturing segment will remain part of the integrated business objectives and strategy and complete the existing property development project,” notes to its third quarter earnings read. On the recent downward revision of gross domestic product growth in a challenging external environment, Kerjaya Prospect said the market “would be challenging but sustainable. Barring any unforeseen circumstances, the group is cautiously optimistic on its overall business moving forward and will continue to sharpen its competitive edge to achieve sustainable growth in the market”. At the helm of Kerjaya Prospek are Datuk Tee Eng Ho and family, who control 70.26% equity interest via Egovision Sdn Bhd and Amazing Parade Sdn Bhd. © All rights reserved 2019. The Edge Communications Sdn. Bhd.